The Cambo V-40 is a pro video camera crane. 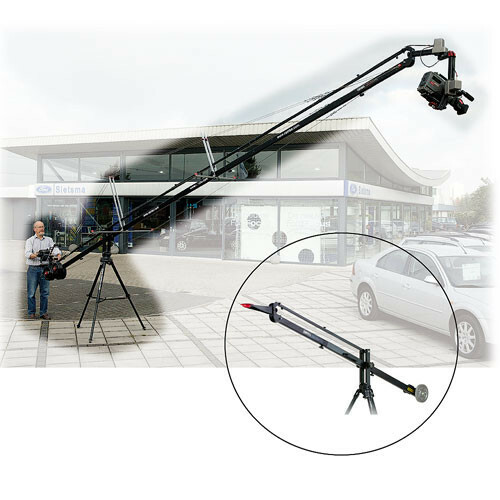 This jib was designed to offer professional crane movement for small- to medium-sized cameras and equipment (up to 36 lbs). It features easy set-up and multiple extension capability with great stability. The V-40 offers an interlocking design for easy assembly; no screws or small clamps, this device utilizes male/female connection with precision security. Smooth pan-action base with locking facility. Provides easy adjustment for a variety of camera weights and boom lengths. The V-40 utilizes a precision bearing base offering a very fluid movement. Adjustable friction allows slow and fast movement along with being able to lock-down for a static shot. With the use of extensions, cables and various control systems, this device can be configured to offer large sweeping movements with great stability. Box Dimensions (LxWxH) 49.0 x 20.0 x 15.0"
exactly what all things comes with this kit? Is it extendable? I mean when its set up can I use it shorter than the 30 something feet?